As a beginner, you may like to use Aida cloth when you try counted cross stitch for the first time. 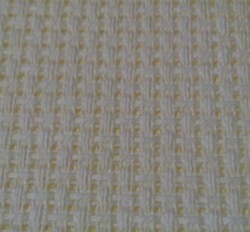 This cotton fabric is a block woven cloth. There are distinct holes between the warp and weft threads. 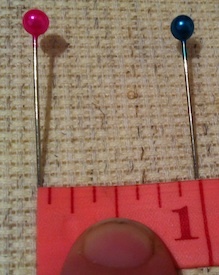 This makes it easy to see where to put the needle. Many manufactured kits include 14 count Aida, as it is the most popular. If you want a more delicate look, then you can opt for 16 or 18 count Aida cloth. But, if your eyes are anything like mine, you may need the help of a magnifier with the finer counts. The number of threads per inch will determine the finished size of your project. My cross stitch calculator will help you to work this out if you change the fabric. I don't stock fabric, but the following links will take you to an online provider. Buying through these links will help me keep the site up, as I earn a small commission each time. The video below shows the different counts and how the stitching looks on each. Aida 11 count is an ideal fabric for children and beginners. Stitchers with some degree of visual impairment are able to use it as well. I suggest using 3 strands of floss if you are cross stitching on this cloth. 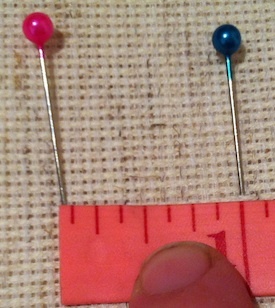 You can use a tapestry needle with a larger eye when stitching on 11 count Aida. I suggest a size 20 or 22. These are easier to thread than the finer needles. Many stitchers find 14 count Aida to be a happy medium. It won't strain your eyes, and doesn't look too blocky. There are enough stitches per inch to reduce the blocky look. The finished size given on a cross stitch pattern is often given based on you using Aida 14. You need a smaller needle, either a 24 or even a 26 for this fabric. Two strands of floss is appropriate. Aida 16 count is a halfway house between the regular 14 and the more dainty 18 count. I like to use it when stitching greetings cards. I often find I can use a smaller aperture, or give a design a little more breathing room. Two strands of floss and a size 24 or 26 needle are ideal here. With 18 count Aida cloth you may need that magnifier! In return, you will create a dainty piece of work. Either 1 or 2 strands of floss work well here, depending on the effect you are trying to achieve. 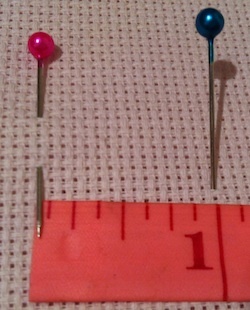 I use size 26 or 28 needles for 18 count stitching. 18 Count Aida Cut, 30 by 36-Inch, Ivory . I hope this page helps you to source Aida cloth for your next counted cross stitch or blackwork project.